Conroe is a town with something to hide. When a white girl is murdered in the high school, suspicion falls on the only black man near the scene, Clarence Brandley. 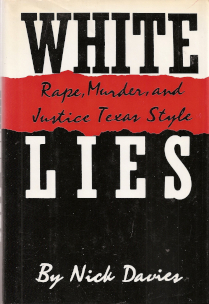 His fight to prove his innocence becomes a struggle to expose the grim truth about the East Texas town. On one side stand the traditional defenders of the old South: the Texas Ranger with his white Stetson and silver badge; the power-mongering District Attorney; the Mayor with his cigar as thick as a swan’s neck. Facing them is an army of underdogs led by a white priest-turned-detective, a tough Texan private eye, a charismatic black community leader and a handful of attorneys who dare to stand up for justice. Pursuing the truth about the schoolgirl’s death through a maze of corruption and violence, Brandley’s supporters seek help from a bizarre cast of unlikely heroes and finally confront the racism that lurks beneath the surface of American life, hidden by the web of white lies. First published by Chatto & Windus (Random House, UK) in 1991.